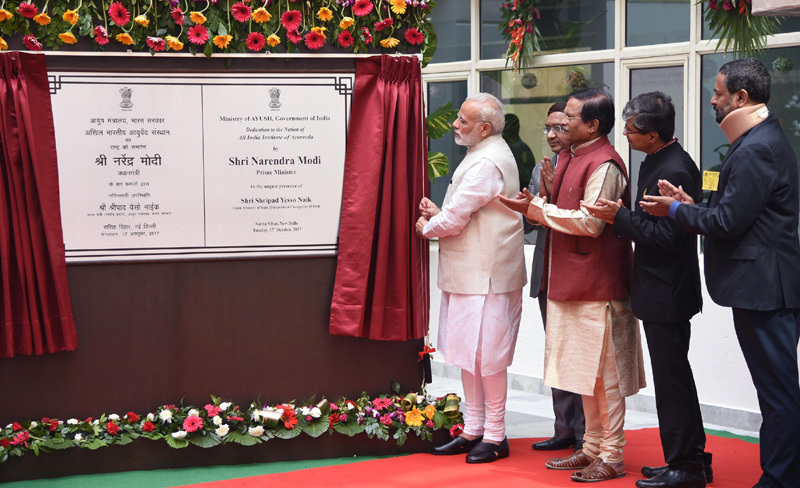 The Prime Minister, Shri Narendra Modi unveiling the Plaque to dedicate first ever All India Institute of Ayurveda to the nation, on the occasion of 2nd Ayurveda Day, in New Delhi on October 17, 2017. The Minister of State for AYUSH (Independent Charge), Shri Shripad Yesso Naik is also seen. New Delhi: The Prime Minister, Shri Narendra Modi, today dedicated the All India Institute of Ayurveda, in New Delhi, to the Nation. The first ever All India Institute of Ayurveda (AIIA) is set up along the lines of AIIMS. As an apex institute under the Ministry of AYUSH, the AIIA will bring synergy between the traditional wisdom of Ayurveda and modern diagnostic tools and technology. Minister of State for AYUSH (Independent Charge) Shri Shripad Naik was also present on this occasion. The Prime Minister asserted that nations cannot progress unless they value and cherish their history and heritage. Those nations who leave their heritage behind, are destined to lose their identity, he added. The Prime Minister said that when India was not independent, its knowledge, and its traditions such as Yoga and Ayurveda were belittled. The Prime Minister said that the Government is working towards establishing an Ayurveda hospital in every district of the country. He said that more than 65 AYUSH hospitals have been developed in the last three years. Shri Naik further added that massive investment is needed to achieve this target. So, the government is also encouraging the private sector to invest in the field of Ayurveda. He appealed to practitioners, students and followers of Ayurveda, to take benefit of programs like Skill India, Digital India, Swastha Bharat-Swaccha Bharat and Start-up India, to fulfill the dream of ‘Ayushman Bharat’. The minister informed the gathering about the steps taken by his ministry to promote Ayurveda and other alternative systems of medicine. He said that in the past two years people’s interest and faith in Ayurveda has increased manifolds. The number of Ayurveda hospitals is increasing even in the private sector. The Ministry has published an ‘Ayurveda standard guideline’ to standardize medicines and treatments in this ancient therapy system. 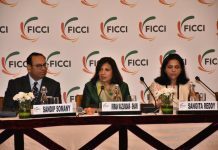 The Pharmacopeia Commission of Indian medicine is working for the standardization of medicines. Shri Naik said that to popularize the Indian systems of medicine the world over, the Ministry has opened Ayush Information Cells in 29 countries. Ayurveda chairs have also been established in a number of countries. 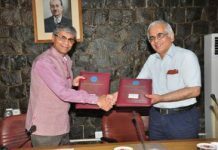 The Ministry has signed an MOU with the National Health Organization of USA for development of Ayurveda and Yoga. On this occasion, The Prime Minister released the “Ayurvedic Standard Treatment Guidelines”. These guidelines were developed by the Ministry of AYUSH. The Prime Minister also gave away the Yoga Award to the Ramamani Iyengar Memorial Yoga Institute, Pune, which was announced earlier this year on the occasion of International Day of Yoga. The All India Institute of Ayurveda (AIIA) has been set up with a total campus area of 10.015 acres with a budget of Rs.157 Crore. It has an NABH Accredited Hospital and an Academic Block. Out Patient Services are being provided in the hospital block of the AIIA and medicines are given free of cost. Currently clinical specialties running in the hospital block are Neurological & Degenerative Disease Care Unit, Rheumatology & Musculoskeletal Care Unit, Diabetes & Metabolic/Allergic Disorders Care Unit, Yoga, Panchakarma Clinic, Kriya Kalpa, Diabetic Retinopathy Clinic, Kshara Evum Anushastra Karma and Infertility Clinic. It also has pathology, biochemistry, microbiology and radiology laboratories/diagnosis facilities. The indoor patient department has provision for 200 beds. The Ministry of AYUSH has requested All State Governments, State AYUSH Directorates, all Ayurveda colleges/ teaching institutions, AYUSH/Health Universities, Associations of Ayurveda Practitioners, Ayurveda Drug Industries and all supporters/ well-wishers and stakeholders of Ayurveda in India and abroad, to observe Ayurveda Day on 17th October, 2017 year and undertake various activities such as organizing public lectures / seminars / exhibitions / radio talks etc., as a part of the Ayurveda Day celebrations. 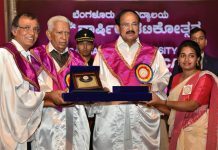 The first Ayurveda Day was celebrated last year.